My Class is the ultimate tool for class and student blogging. It allows you to connect student blogs to your class blog where you can control the student blog privacy, comment moderation and post moderation on all student blogs with just one click. My Class isn’t automatically enabled on Edublogs Campus blogs. Please Edublogs support if you would like to use My Class on a Campus blog. 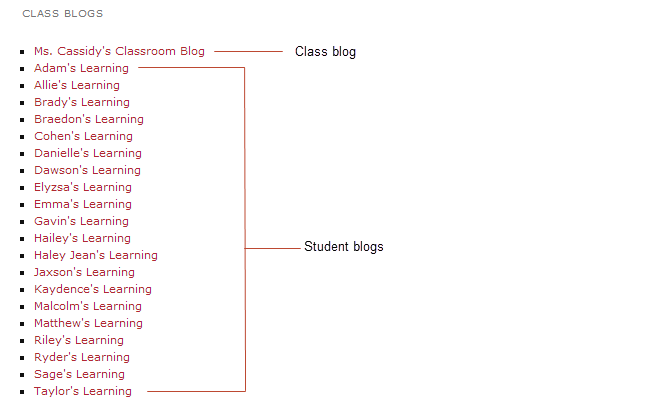 How do students navigate between the class blog and their student blog? What is the easiest way for students to find their class mates’ blogs? How do I check posts and comments on student blogs? 1. Go to My Class > Create a Class. 2. 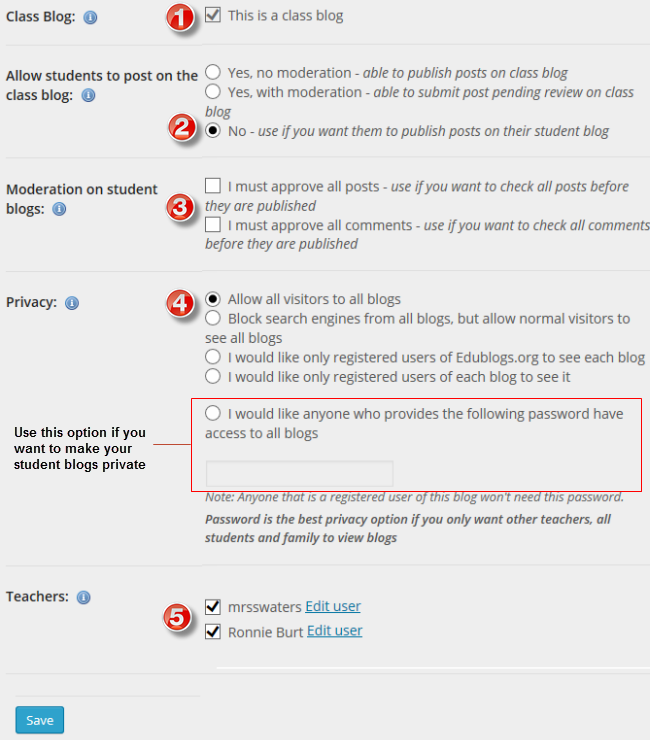 Select “This is a class blog” (1), ”No – use if you want them to publish posts on their student blog” (2), choose if you want to moderate posts and comments on student blogs (3), your preferred privacy option (4) and which users you want to manage your student blogs (5). 4. The My Class menu should change to the menu item shown below. The Class settings control what your students are able to do on both the class blog and their own individual students blogs (if you choose to have student blogs). You can update these settings at any time by going to My Class > Class Settings, changing the settings and then click Save. Changes are automatically reflected on all student blogs attached to the class blog. For more information refer to the My Class Settings support documentation. When you set up My Class your student users are added as user to the class blog and to the student blog. The menu items they see depends on which dashboard they are logged into and what settings you have set in My Class > Settings. If your students see limited menu items it means they are logged into the Class blog dashboard and need to navigate to their student blog dashboard. 1. Go to My Sites dropdown menu in your admin bar. 2. Click on the dashboard of the blog you want to access. The easiest way for students to find each other’s blog is to add the class blog widget to the sidebar. The class blog widget provides a handy link to all student blogs attached to My Class. Students just need to click on the link to easily go to a class mates blog. 1. Go Appearance > Widgets. 2. 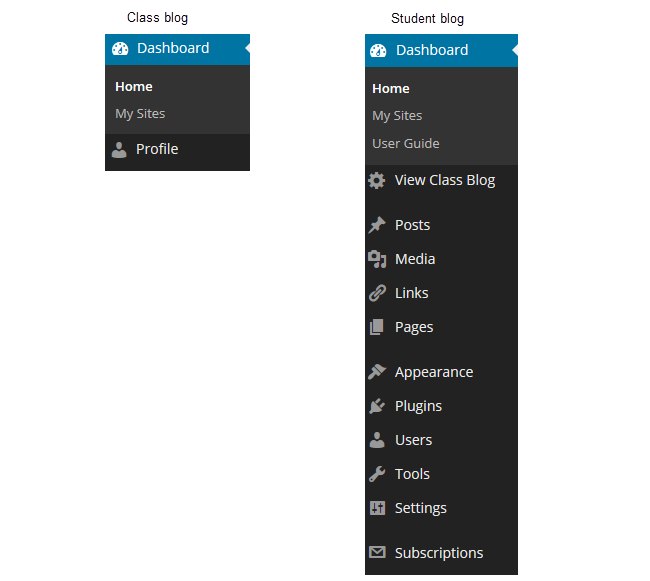 Add the class blog widget to the desired sidebar. 3. The widget will automatically open. 4. Select ’No’ under Public only if you are using private blogs (1), alphabetical (2), the number of blogs (3) and then click Save. Any time you add any more student blogs to My Class you update the Class blog list by opening up the Class blog widget and clicking Save. Student posts and comments can be checked using My Class > Student blogs, Dashboard > My Sites or Users > Reports. My Class > Student blogs and Dashboard > My Sites is where you’ll see all your student blogs listed. Here is where you can use the Dashboard link to access their blog; where you’ll see the number of published and pending posts / pages / comments on their blogs. Clicking on pending under a student blog takes you to the pending post or pending comments page inside their student blog dashboard. Where you can edit, approve or publish the post or comment. Reports, via Users > Reports, allows you to run a report on a specific student. It allows you to check comments they’ve submitted on any blog or posts they have published and choose the date range you want to check.